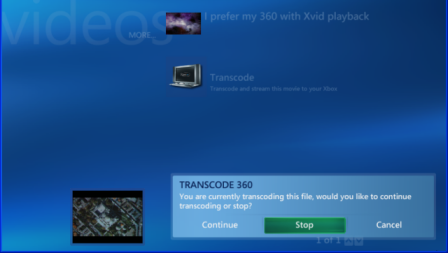 Transcode 360 enables the playback of unsupported video over Xbox 360 and Media Center Extender devices. This software is designed to run on Windows XP Media Center Edition 2005. Transcode 360 is fully featured, providing a clear and efficient interface, tightly integrated with your Media Center PC to enable a much more seamless experience than other 3rd party solutions. On your media extender, highlight the video you wish to watch and press the Info button on your remote to start enjoying video played back to you via Transcode 360. Advanced users can configure Transcode 360 to run in distributed mode, delegating the CPU intensive task of transcoding movies to more powerful computers in their home network.